Is it futile to blog a phenomenon already noted by BoingBoing and Language Log? Probably, but does it matter? As reported by the BBC, Swansea council neglected one of the basic principles of multilingual publishing: employ competent proofreaders for each of the languages you’re publishing in. Even if you have an in-house translation service, as is the case of Swansea council. 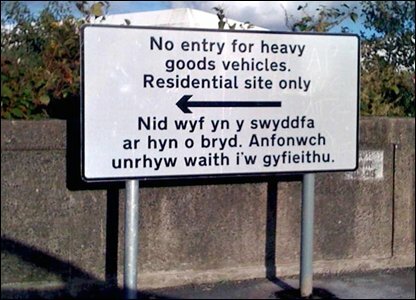 When officials asked for the Welsh translation of a road sign, they thought the reply was what they needed. Unfortunately, the e-mail response to Swansea council said in Welsh: “I am not in the office at the moment. Please send any work to be translated”. 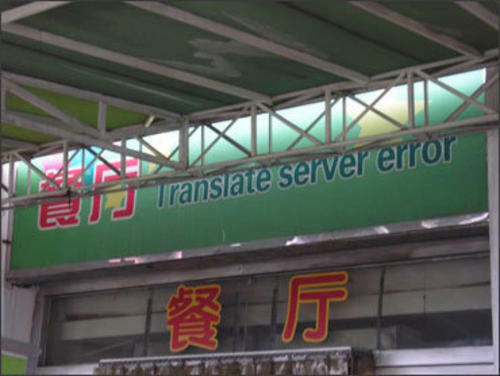 The only similar example I’ve recently seen was the Chinese dining hall (located on the Beijing-Taiyuan expressway) that was advertised as “Translate server error” on a billboard. The Chinese reads "dining hall"
Here in the West, we like to make fun at the sometimes misguided Chinese efforts to adopt English in public signage alongside with the local language. And face it, they are funny. What we may be forgetting is how easy it is to fall into the same trap if you have similar requirements, as is the case for public officials in bilingual areas, who are likely to have a legal duty to promote languages they may not, themselves, master. Posted on November 1, 2008 September 14, 2009 Author chris waiglCategories enTags Chinese, language, multilingualism, translation, Welsh1 Comment on Bilingualism FAIL.